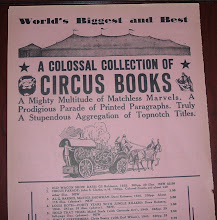 A bookseller from Iceland more than fifty years ago created this bit of ephemera with a double-biblio angle for my collection--books and philately (bibliophemera and bibliophilately). 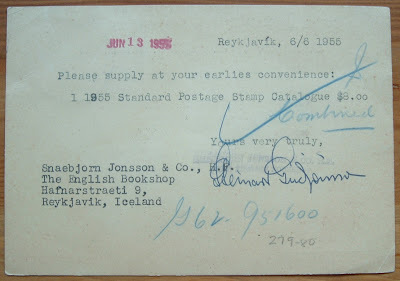 This is an interesting postcard from the Icelandic bookseller Snaebjorn Jonsson & Co., The English Bookshop, in Reykjavik. They sent this postcard to Scott Publications, Inc., a publisher of stamp catalogs and other publications pertaining to stamp collecting (I used to get their catalogs when I was a kid). 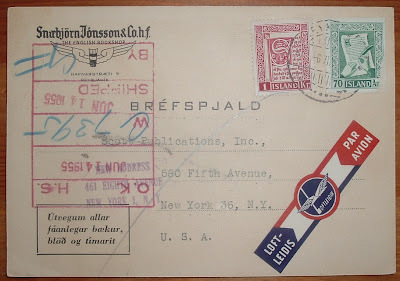 Of interest is the identification of a bookseller in Iceland and the Icelandic history depicted on the stamps used to mail the postcard. 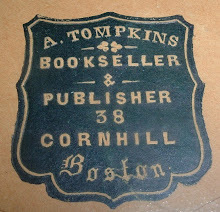 The history deals specifically with antiquarian books and manuscripts. 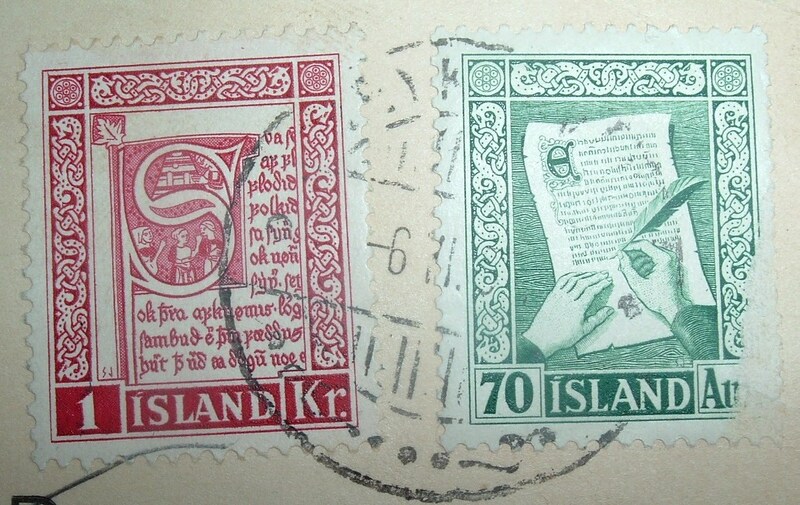 The two stamps on the postcard are from a 1953 set of five issued to commemorate Iceland's literary heritage. 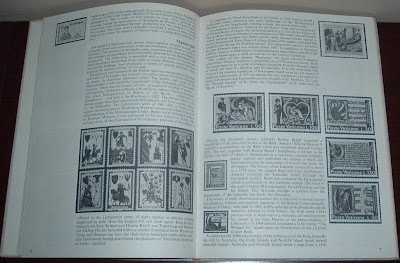 I've been researching these stamps and the literature depicted on them for the better part of this year. The leads have been hard to come by, but just as I had pieced together the start of this post, I discovered Leona Rostenberg's research. The late Ms. Rostenberg, a well-known rare book dealer and stamp collector via her passion for books, wrote in 1978 an article for the American Philatelic Society titled, Bibliately ...a new philatelic word, for a new scholarly philatelic topical, the history of books on postage stamps. 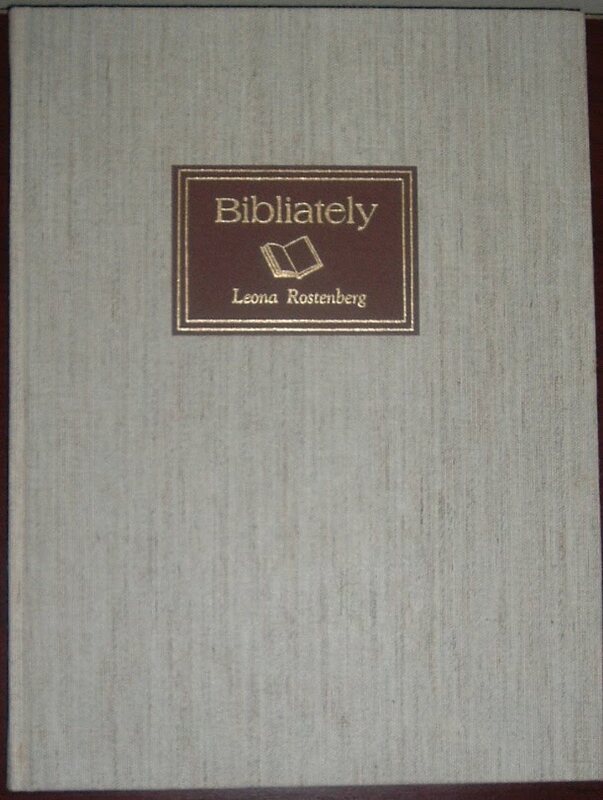 That article was reprinted in book form, a copy of which I now have. 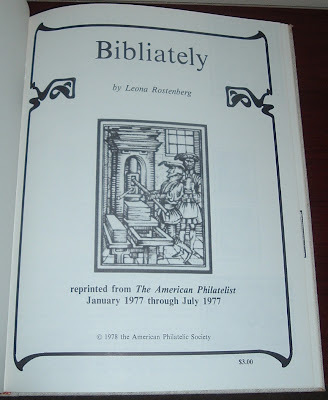 The coined term bibliately seems to have given way later to bibliophilately (which I prefer), or maybe I should say "amended by.' Larry T. Nix offers on his excellent site some distinction between the two terms. During the thirteenth century Iceland's Bishop Brand compiled a paraphrase of the historical books of the Bible which was completed through Exodus Stiorn, one leaf of which is reproduced on a one-krone Icelandic stamp. That one-krone (Kr. 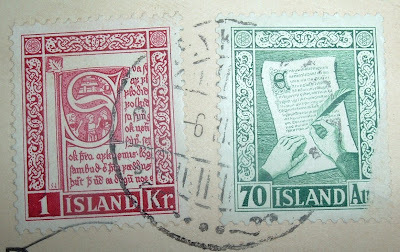 ), or króna, stamp is the one on the left on the postcard. 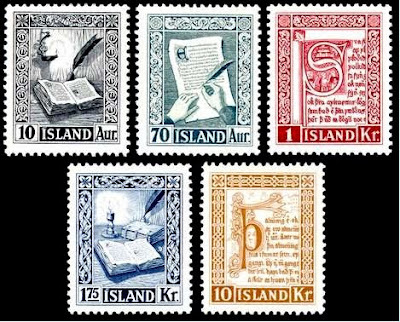 The two stamps on the postcard are from a set of five issued in 1953 (Scott 278-288) to commemorate Iceland's literary heritage. The two stamps depicting an open book, the 10 Aur. (Aurar) in black and the 1.75 Kr. in blue, depict the manuscript of an early law book. As for the 10 Kr. and 70 Aur. stamps, the leads grow cold. They depict Medieval manuscripts, perhaps a representative depiction of the Icelandic eddas and sagas rather than any particular manuscript. Back to the bookseller who started all this... Snaebjorn Jonsson was a writer, publisher, and bookseller, whose English Bookshop is referenced in the return address on the postcard above. 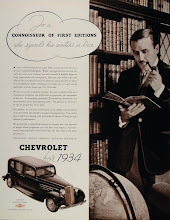 From a Time Magazine issue of December 6, 1926, I learn that Editor could also be added to Jonsson's resume. He is referenced as having edited the first first Year Book of Iceland. The writer of the Time article seems equally taken with Jonsson's physical attributes as with his wordsmithing abilities, describing him as follows: "...a blond, curly-haired, strapping, virile, industrious Icelandic clerk and translator to the Danish Ministry of Industries." I can't speak to the "strapping, virile" qualities, but "industrious" is quite evident from the pieces of business history that fall into place researching this man. In 1927, following up on his editing work of the Year Book, he wrote the Primer of Modern Icelandic. He became a publisher (Snaebjorn Jonsson & Co.) and branched off into bookselling, with The English Book Shop. So this postcard proved to be a nice little piece of ephemera that offers a bit of insight into the literary, philatelic, and bookselling history of Iceland. I suggest you a links exchange. I just add a link to your blog in my website. Description: Multilingual encyclopedia composed around four sections: personages, fauna, flora and geography. Image gallery about iconography, genealogy, history, art and taxonomy. Thank you for the link. You've got a wonderful site, well-designed. The focus here is ephemera related to books, but stamps occasionally wander in from the periphery, as do other items when topical. 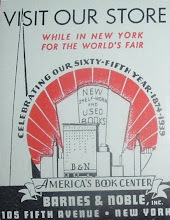 Your site could be of interest to readers here whose interests in books, ephemera, and stamps sometimes come together. Glad to add your site to the links section. He was my great grandfather ... and I know so little about him. He was my great grandfather I know very little of him. Steve, Steini do you know anymore about him that you could tell me? Thank you for the comment, Steini. It's always gratifying to know that something I've posted here has helped provide information on a personal level in some way for someone. Hopefully, it will provide enough clues to find even more about your grandfather.